What if I hit a deer? | What Car? What if I hit a deer? **What if I hit a deer? I drive through Richmond Park to get to and from work every day, and quite often have to stop because of a deer (or five!) on the road in front of me. Although the speed limit is only 20mph, I imagine this is fast enough to injure or even kill a deer. What should I do if I'm unlucky enough to hit one? If you hit a deer you should report it to the police as soon as possible. They will be able to arrange assistance if the deer has been injured, or for the carcase to be removed if the deer has been killed. 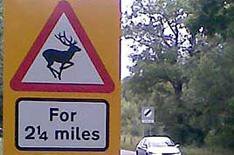 In the event of a collision, don't approach the deer. If it is injured and still alive, it will be petrified and may try to attack you. Stay well clear and wait for assistance. If you hit a deer in one of London's royal parks, you should inform the park police. If it's an emergency, call 999. Otherwise phone 020 7706 7272. Colliding with a deer can cause serious damage to your car. Call your breakdown company if the damage is anything more than cosmetic, and arrange to be towed to a local bodyshop. Provided you have fully comprehensive insurance, you shouldn't have to pay for the repair.